This topic lists and describes the shutdown and startup sequence for Pivotal Container Service (PKS) including PKS-provisioned Kubernetes cluster nodes, PKS control plane components, and vSphere hosts. To perform a graceful shutdown of all Kubernetes, PKS, and infrastructure components, complete the following tasks in sequence. Shut down all customer apps running on PKS-provisioned Kubernetes clusters. Note: This task is optional. Perform it after considering the types of apps you have deployed. For example, stateful, stateless, or legacy apps. Shut down all PKS-provisioned Kubernetes clusters following the procedure defined in the How to shutdown and startup a Multi Master PKS cluster knowledge base article. Using the BOSH CLI, retrieve the BOSH deployment name of your PKS clusters by running the following command. Kubernetes cluster deployment names begin with service-instance_ and include a unique BOSH-generated hash. Using the BOSH CLI, stop the Kubernetes worker nodes by running the following command. Note: When you use the BOSH stop command, all processes on the Kubernetes node are stopped. BOSH marks them stopped so that when the VM is powered back on, the processes do not start automatically. Using the BOSH CLI, stop the Kubernetes master nodes by running the following command. Verify the node type by checking the “job” name in the the Custom Attributes pane. Perform a graceful shutdown by right-clicking the target VM and selecting Power > Shut Down Guest OS. Using the BOSH CLI, retrieve the BOSH deployment ID of your PKS deployment by running the following command. PKS deployment names begin with pivotal-container-service and include a unique BOSH-generated hash. Using the BOSH CLI, stop the PKS control plane VM by running the following command. 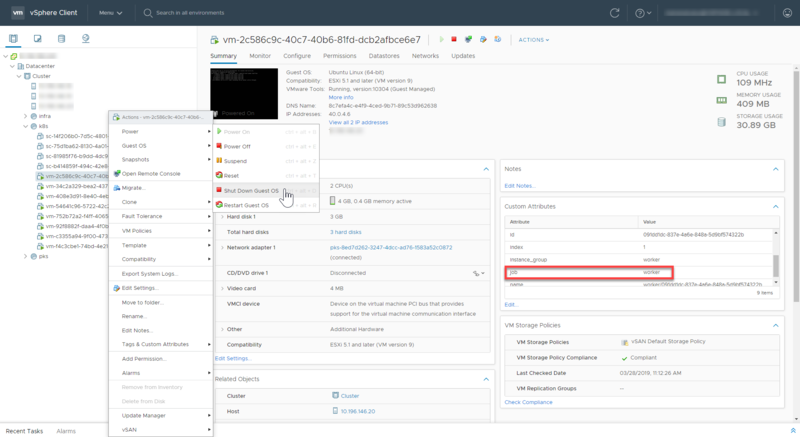 Using vCenter, locate and gracefully shut down the PKS control plane VM. Using the BOSH CLI, retrieve the BOSH deployment ID of your Harbor Registry deployment by running the following command. Harbor Registry deployment names begin with harbor-container-registry and include a unique BOSH-generated hash. Using the BOSH CLI, stop the Harbor Registry VM by running the following command. Using vCenter, locate and gracefully shut down the Harbor Registry VM. Using vCenter, locate and gracefully shut down the BOSH Director VM. Using vCenter, locate and gracefully shut down the Ops Manager VM. Select Actions > Shutdown from the menu. For more information, see Reboot or Shut Down the vCenter Server Appliance in the vSphere documentation. See also the following KB article for additional methods of shutdown: How to stop, start, or restart vCenter Server 6.x services. Note: The vSphere Client is no longer be available after this vCenter VM is shut down. Using a browser, navigate to the HTTPS IP address of the ESXi host, for example: https://10.196.146.20/. Log in using vSphere administrative credentials. 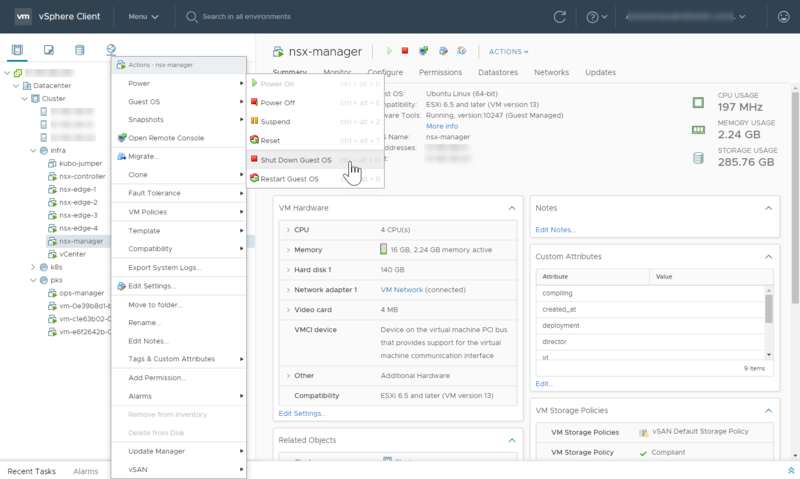 Put the ESXi host in maintenance mode by selecting Actions > Enter maintenance mode. View a larger version of this image. Use the EXSi web interface and select Actions > Shut down. Use the remote management console for the host, such as Dell IDRAC or HP iLO. View a larger version of this image. To restart all Kubernetes, PKS, and infrastructure components, complete the following tasks in the sequence presented. 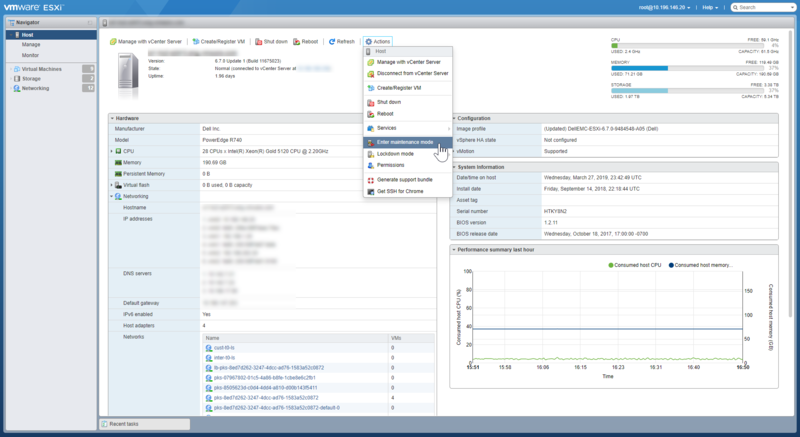 Using the remote management console, such as Dell IDRAC or HP iLO, power on each ESXi host. 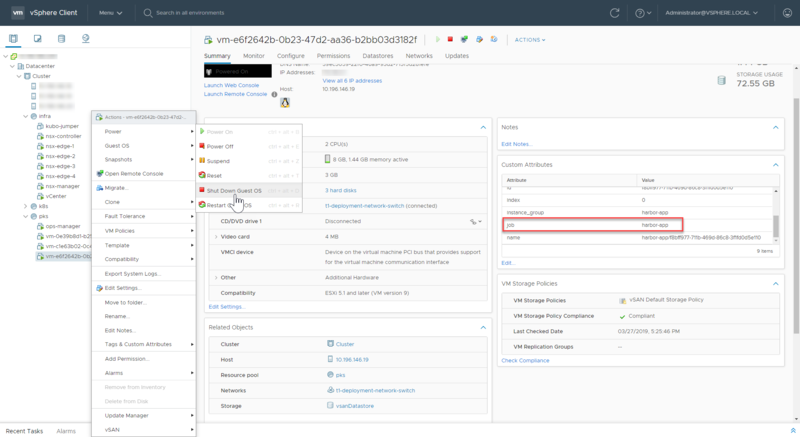 Connect to the web interface of each ESXi host and exit maintenance mode. 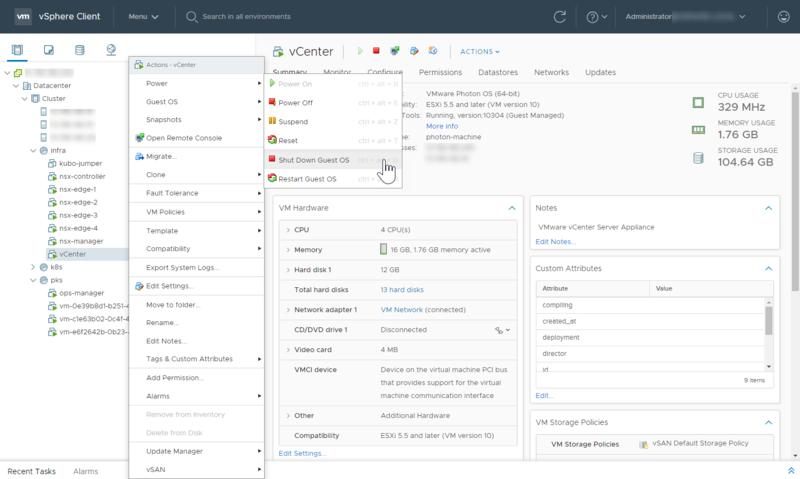 Connect to the web interface of the ESXi server that hosts the vCenter VM. 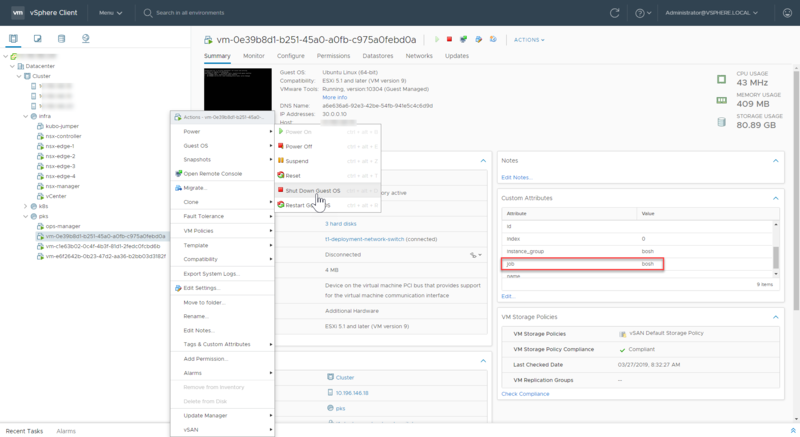 Select the vCenter VM, and click Power On. Log into vCenter using the vSphere Client. 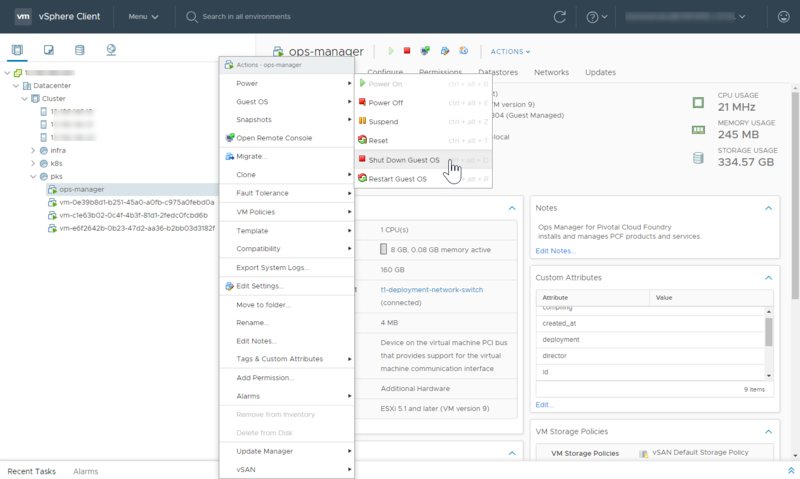 Using vCenter, power on the Ops Manager VM. 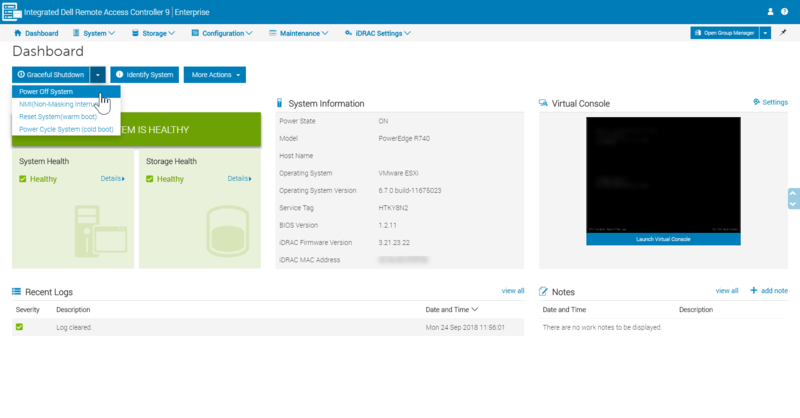 Using vCenter, power on the BOSH Director VM. Note: BOSH is aware that all the VMs under its control were stopped. BOSH does not attempt to resurrect any VMs, which is the desired behavior. It may take approximately 90 minutes for BOSH to start properly. Obtain the BOSH Director VM Credentials from Ops Manager. For information about doing this, see Retrieving Credentials from Your Deployment in the Pivotal documentation. SSH to the BOSH Director VM. You should see that the uaa and credhub processes are now running. At this point, the BOSH Director should be fully up and running. Using vCenter, power on the PKS control plane VM. Using the BOSH CLI, start the PKS process on the VM by running the following command. Note: Because you stopped the PKS process using BOSH, you must restart it using BOSH. Using vCenter, power on the Harbor VM. Using the BOSH CLL, run ssh to access the first PKS master node and start etcd. Using the BOSH CLI, start the next PKS master node. Using the BOSH CLI, start all remaining PKS master nodes including the master where you started etcd. Using the BOSH CLI, start all PKS worker nodes. For exact Kubernetes node startup instructions, refer to the How to shutdown and startup a Multi Master PKS cluster knowledge base article. Start all apps running on the PKS-provisioned Kubernetes clusters.